Mid-size diesel sedans have always been a bit special. Affordable, comfortable, attractive to look at and very efficient, these cars deliver almost everything you get in a full-size sedan. Of late though, these have been overshadowed a bit by sub-four-metre sedans like the Maruti Dzire, Honda Amaze and Hyundai Xcent. 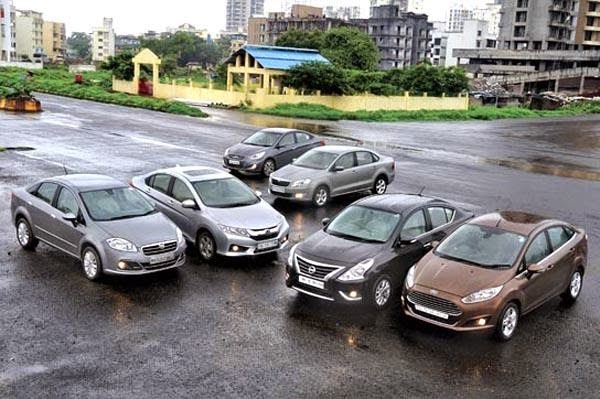 But if you want a proper, grown-up family car, it’s these mid-sizers you should be looking at; they offer so much more in terms of size, space, performance, stability and features, and many of these diesel sedans deliver class-transcending performance as well. Here’s a brief introduction. The Ford Fiesta and Nissan Sunny have both received makeovers recently, bringing them up to date. Also in the fray is Fiat’s updated Linea, which has a new exterior and interior, making it even more desirable. The Honda City is the current favourite and is a runaway success in the segment. Its combination of a powerful yet efficient diesel motor and supremely comfortable cabin has been a big hit among buyers. Skoda also gave its Rapid a light update, and its combination of solid build and strong diesel engine is quite formidable too. Then we have the ever popular Hyundai Verna, which got a host of updates last year and, as ever, is a very strong contender. So, which one is the best mid-sizer? The facelifted Ford Fiesta is powered by the 90bhp, 1.5-litre engine that also does duty in the EcoSport. This powerplant’s ready responses and instant power delivery at low-to-medium engine speeds make it very easy to drive in traffic. The Ford is happy to amble around in third gear, even at speeds as low as 30-40kph and it picks up the pace quite well too. What further helps, is its five-speed manual gearbox, which is light and has a nice, mechanical feel to it. It’s out on the highway that the Fiesta begins to feel a bit out of its depth. You need to work the engine really hard when you have to execute a high-speed overtake, and this is where cars like the Skoda Rapid feel much stronger. That said, the Fiesta’s refinement is quite impressive. The motor feels composed for the most part and only gets a bit noisier closer to the redline. The Ford managed to set some brisk times in our acceleration tests. It took 13.9 seconds to get to 100kph and reached a top speed of 171kph. The mechanicals in the updated Sunny also continue unchanged, though the engine has been given a re-tune. The 1.5-litre dCi motor produces 85bhp, the same as the old car, and the engine is the smoothest here, especially on the move. Power delivery is linear and builds smoothly from around 1,500rpm with a stronger tug around the 2,000rpm mark. That’s not to say the engine is free from any turbo lag. Driving uphill, you will need to keep shuffling between third and second gears to maintain momentum. However, the smartly chosen gear ratios do mask the lag quite well and keep the engine in its 2,000-4,000rpm comfort zone. This, and the Sunny’s light 1,097kg kerb weight, mean real-world performance is actually quite good. It takes only 12.8 seconds to reach 100kph which makes it the third-quickest here. In the in-gear timings, the Nissan impresses as well. The sprint from 20-80kph in third gear took 12.66 seconds and 15.13 seconds from 40-100kph in fourth, making it one of the best performing cars here. That brings us to the third recently updated car, the 89bhp Linea. Fire up the familiar 1.3-litre motor and it settles into a soft idle. Snick the gearlever into first, let go of the super-light clutch and you’ll like the way it smoothly moves off the line. The spec sheet says the Linea makes 20.08kgm of pulling power at 1,750rpm, but you feel this torque kick in only when the engine is spinning closer to 2,500rpm. Wait a bit, let it spin to 2,500rpm, and when the turbo kicks in, the Linea gets a bit more punch in the mid-range. It performs best when you upshift at around 4,500rpm and stay above 2,500rpm. But you have to make the engine strain to get any semblance of performance from it. Not surprisingly, the Linea is the slowest in this test. The combination of the small motor, a high 1,230kg kerb weight and tight gearing hampers its outright performance. It takes a leisurely 18.92 seconds to get to 100kph and even the in-gear times are the slowest. The new City is powered by Honda’s 1.5-litre diesel engine, which makes 98.6bhp, and it is the least refined among this bunch. Start the all-aluminium motor and it settles down well enough. But the clatter starts as soon as you get off the line, and it never really goes away. This apart, however, it is hard to fault this very capable motor. As soon as you set off, you’ll notice there’s no throttle lag to speak of and, unlike most other cars here, it produces power in a smooth, linear manner. There’s plenty of grunt from as low as 1,200rpm, and it pulls strongly to about 3,800rpm. The power then gradually tails off till it hits a very conservative 4,200rpm rev limit. Acceleration isn’t too strong, and the City manages a 0-100kph time of 14.75 seconds. What helps the City though is the six-speed gearbox. With more ratios to play with, the gearbox makes the most of the engine’s available power and you never feel short on power in any condition. The Skoda Rapid’s strong mid-range allows it to perform well. The 1.6-litre motor produces a very healthy 105bhp and 25.5kgm of pulling power. The engine is very responsive with minimal lag, and when you cross 2,000rpm, the Rapid simply takes off. Also amazing is the broad pulling power range of this engine. Unlike the other diesel engines here, which fall off a cliff after 4,000rpm, the Skoda keeps pulling strongly till 5,000rpm. The extra revs give the engine amazing flexibility and you can choose to cruise in virtually any gear from two to five, whether in the city or on the highway. The Rapid, on full throttle, will get to 100kph in 11.44 seconds. That makes it one of the quickest in this test, just behind the Verna. But in day-to-day driving, the Rapid’s massive pulling power and clever gearing give it an edge, the 20-80kph in-gear run taking just 8.7 seconds to a Verna diesel’s 13 seconds. The diesel Verna has the most powerful engine here. In a straight line, it is the fastest, taking a scant 10.54 seconds to reach 100kph and getting to its top-speed of 191kph rather easily. That said, there is a fair bit of lag below 2,000rpm. Even then, at low revs, it has enough grunt, and driving the Verna in the city is an effortless affair. This engine is a lot of fun when you work it hard and past 2,000rpm, there is a strong surge and the speed picks up quite rapidly. Out on the highway, the strong engine responses mean the Hyundai is in a league of its own here. In this test, we have three European and three Asian sedans. Subsequently, the way they drive is worlds apart. is at all speeds – low, medium or high. The Sunny may be typically Japanese, but what is very impressive is its ride quality. This sedan competently absorbs rough sections and bad roads, thanks to its tyres and the pliant suspension, which works silently. Sound insulation is impressive too, but unlike the Europeans, you get a thunk each time you hit a coarse patch. That said, the Sunny remains a tidy-handling car with only some amount of body roll. The steering is really light and comfortable at city speeds and offers decent feedback on the highway too. Like the Ford, an area where the Linea simply excels is ride quality. In fact, the tall springs and high-quality shock absorbers result in an even better ride than the Fiesta. Almost no shocks filter in from the road and even the largest bumps are dealt with noiselessly. Even when you up the speed, the Linea rides flat, only pitching a bit at times. Even though the steering is a tad too light, it’s direct and delivers decent feel. And despite its lower power output, the new Linea is still loads of fun. The car rolls a bit, but holds on gamely, and the best bit is that it encourages you to go faster. Honda has stiffened the suspension on the new City and this has affected its low-speed ride. At walking speeds, the ride isn’t exactly plush and sharper edges thump into the cabin quite easily. But as soon as you go a bit faster, the City’s ride smoothens out, and it feels rock solid on the highway. Though the new City continues to ride on extremely thin tyres, dynamically, it’s still very sound. Throwing the City hard into corners does result in the tyres fighting for grip, but it isn’t as bad as you may imagine for such slim rubber. The electric power steering is accurate as well and is now more realistically weighted. However, it does lack feel, and the feedback from the front tyres is very limited. The Rapid feels incredibly stable at speed, has plenty of grip and has good handling characteristics too. It rides very well at low speed and takes well to the largest of potholes. But the car’s high-speed ride quality isn’t quite as accomplished as the Linea’s or the Fiesta’s. The suspension is a bit clunky. The front suspension is a touch too soft and the nose bobs up and down on an uneven surface. And its suspension is the Verna’s weakest link. Hyundai has tweaked the suspension settings on the 2014 Verna and this has cured some of the old car’s nervousness at speed and some of its floaty quality. The steering now also has more weight and the low-speed ride remains quite good. However, the suspension does still run out of travel over sharper bumps; this results in a painful thunk as the dampers compress fully and hit the bump stops. And at speed, though improved, the Verna still doesn’t feel much better; the rear feels soggy when you make sudden inputs to the steering and it still feels the most nervous of the lot here. When you are paying upward of Rs 10 lakh for a car, you not only expect comfort on the inside, but want some luxury and quality as well. The updated Fiesta gets a new black and grey colour scheme for its cabin and subtle changes in other places too. A new glossy black trim for the centre console on this Titanium trim and contrasting grey seats do improve the ambience, and the equipment levels have gone up as well. The dashboard is nicely textured with soft-touch material, but some plastics lower down still look shiny and cheap. What really lets the interiors down is the rear seat, which simply can’t match any of the others for space. It is severely cramped and the small rear windows add to the cooped-up feeling. The saving grace are the front seats, which provide fantastic support. Slide into the new front seats of the updated Sunny and you’ll notice there are quite a few changes here. The glossy black centre console, for example, looks far better than the old car’s dull sea of grey. The overall look and feel is the same, and there are plenty of silver highlights all over the dash. Where the Sunny delivers in spades is the amount of cabin space it offers. Such is the space in this car that rear passengers can easily sit with their legs stretched out, as they would in a limo. What the back seat lacks is sufficient thigh support. The front seats are very generous as well, and finding a decent driving position is easy enough. Fiat’s Linea is like a breath of fresh air on the inside. The carmaker has completely revamped the cabin and the all-new dashboard has even more Italian flair than before. There is a new black and cream colour scheme, with a glossy black finish for the central AC vents and audio system, which are very neatly integrated. There’s soft-touch plastic here too, and even concealed ambient lighting that bathes the cabin in a warm orange glow. The hooded binnacle sports new dials that are elegant looking, but aren’t easy to read on the move. The quality levels are a big step up, with buttons and levers that feel solid and well damped in their operation. But look around a bit, and you will find the odd rough edge. The perforated leather seats, both front and rear, offer superb support and although knee-room for rear passengers is not as good as in the City or the Sunny, there is still decent space here. The biggest problem at the rear is the shortage of headroom, and taller passengers will find their heads brushing against the well-finished roof lining. Step into the City’s ultra-spacious cabin and you will be blown away by the comfort the seats offer. The soft seatback of the driver’s seat holds you snugly in place, and the seats feel almost sofa-like. The dashboard, with its glossy black theme, is quite appealing, and the feather-touch air-con controls function with a slickness that gives it an air of sophistication. The City easily has the best rear seat – a combination of soft cushioning, comfortable backrest angle and loads of space. The seats are at the right height and this makes it easy to get in and out as well. However, tall passengers will feel hemmed in by the low roof lining, and the fixed headrests aren’t the safest either. The Skoda’s dashboard is straightforward and maybe a bit unexciting when compared to the competition. The combination of light grey and beige looks a bit too dreary, and it doesn’t have the flair of the Linea or the sophistication of the City. But where it scores is with that typical strong European build and the widest range of adjustment for the driver’s seat. In fact, the Rapid is the only car to offer reach as well as rake adjustment for the steering wheel, and finding an ideal driving position is very easy. The rear seat has enoughroom and the bench itself is supportive and comfortable. The lever by which rear passengers can push the seats forward is very convenient too. The Verna’s two-tone dash with wood and silver inlays looks a bit traditional compared to the City’s, but it is still quite appealing. And though it isn’t as easy to use as the City’s or even the Sunny’s dash, finish and overall quality are impressive. Also, the front seats have superb bolstering and the low dash makes it easy to see the road ahead. The Verna is less than impressive at the rear – the seat is low and lacks thigh support, and because of the car’s angular styling, the rear windows are quite small as well. The Fiesta now only comes with a diesel engine option. Ford is offering the Fiesta in three variants at a starting price of Rs 7.69 lakh for the base Ambiente trim and Rs 9.29 lakh for the top Titanium trim. The standard warranty on offer is of two-years/1,00,000km. The Linea diesel is available in two variants – Dynamic and Emotion – with the top variant costing Rs 9.72 lakh. Fiat is offering a standard warranty of two-years/80,000km. Prices for the Sunny diesel start from Rs 7.99 lakh and go up to Rs 9.8 lakh for the top XV Premium variant with leather option. Nissan offers a standard warranty of two-years/50,000km. The diesel-powered City sedan starts at Rs 8.37 lakh for the base variant and the top VX model costs Rs 11.1 lakh. The City comes with a two-year/ 40,000km warranty. The Skoda Rapid’s prices start at Rs 8.26 lakh and go up to Rs 9.97 lakh for the top Elegance variant. Skoda offers a two-year/unlimited km warranty on the Rapid. The Verna, on the other hand, comes in five variants and prices for the 1.6 diesel start from Rs 8.35 lakh and go up to Rs 10.80 lakh for the top-of-the-line SX (O) variant. Like Skoda, Hyundai offers a two-year/unlimited km warranty on the Verna. On the fuel efficiency front, the Honda City is the most frugal in this test with an overall figure of 16.85kpl. The Verna, Rapid, Sunny and Fiesta are quite closely matched with overall figures of 15.85kpl, 15.55kpl, 16.15kpl and 15.65kpl, respectively. The Linea, thanks to its high kerb weight, is the least efficient, with an overall figure of 15.2kpl. The Fiesta Titanium variant is very well specced. It gets features like auto climate control, cruise control, ‘guide me home’ headlamps, electrically adjustable mirrors, automatic headlamps and wipers, puddle lamps, electrically folding mirrors, keyless entry and go and rear parking sensors. Additionally, it comes with the updated version of Ford’s Sync, with the ‘Emergency Assist’ safety feature. The Nissan Sunny diesel, in the XV premium variant, comes with a good amount of features. It gets rear-view camera, keyless-go, a CD/MP3 player and automatic climate control. It also gets an integrated four-speaker audio system and has follow-me-home headlamps and electrically adjustable and folding rear-view mirrors. The Linea is well equipped, but not as well as the Fiesta or the City. It comes with an audio player with Bluetooth, aux and USB connectivity, rain sensing wipers, auto on-off headlamps, rear parking sensors, cruise control, climate control and a collapsible rear curtain. As far as safety is concerned, it gets ABS and airbags. The Honda City VX diesel easily overshadows its rivals in this department. It’s the only one that comes equipped with a sunroof. Additionally, it even gets an integrated four-speaker audio system which has four tweeters and a five-inch screen that doubles up as the rear-view camera display which offers wide, normal and top-down view. Also, the AC gets feather-touch control and there’s leather upholstery along with a leather-wrapped steering wheel. But the VX trim is a lakh more expensive than the V variant and it only misses out on keyless-go, leather upholstery and sunroof. So, if you don’t find these features necessary, the V variant makes more sense. The Rapid diesel, in top Elegance trim too, gets a few unique features like tilt and telescopic adjustable steering wheel and windows which can be opened and closed with remote key. Another distinguishable feature is that the front passenger seat can be pushed ahead by rear passengers to improve legroom. But some features like electric folding mirrors, rear parking sensors and leather upholstery is missing. To keep passengers entertained, it has a four-speaker music system with USB, aux-in and Bluetooth compatibility. Like all Hyundais, the Verna offers long list of equipment as well. The top SX variant comes with an integrated music system with USB and aux-in, parking sensors and rear-view camera, electrically foldable mirrors and a cooled glovebox. The SX (O) adds chrome bits inside and out along with leather upholstery. The Linea is a solid package. It’s well priced, has a big-car feel, rides and handles beautifully, and has large and comfortable seats. It also feels the most robust and solidly built here. The recently updated interiors have taken the ambience of the cabin up a notch, and it’s now better equipped as well. The Linea, however, loses out because its engine does not deliver the performance you expect of it. And despite the updates, the car is beginning to feel its age. The Verna is getting a bit long in the tooth too, what with all the fresh metal here. It still looks attractive, equipment levels are still impressive, and engine performance and refinement are exceptional. Hyundai has improved the way it rides and drives too, but the difference is only marginal, and ride and handling are still weak areas. Also on that list are back seat comfort and space. And the engine still takes a bit to get going in traffic. The Skoda Rapid comes across as solid, no-nonsense car that is very practical and good at getting the job done. The solid build quality, superb highway manners, ample space in the rear and strong engine give it a big-car feel some cars here just can’t match. The engine is a bit noisy, the car lacks flash and the insides are very basic as well. It needs to have much more appeal to move up the charts. The new Fiesta, on the other hand, has an Aston Martin-like nose, a recently updated cabin and plenty of appeal. It is superbly priced, there’s plenty of equipment, including some standout features like the voice control system, and the engine and gearbox work well together too. The best bit, however, is that it has Ford DNA coursing through its veins; it is a real hoot to drive. If only it had more space in the rear. The Sunny comes really close to delivering a winning performance. It’s the biggest on the inside, the updated cabin is really good and the equipment count has gone up substantially as well. Additionally, the ride is comfortable, the engine is refined and punchy and it is quite agreeable to drive. The Honda City, however, wins because it is the best all-rounder. Sure, the noisy engine is a serious issue that Honda needs to set right, but on every other count, it is the best car. It is the most fuel efficient, the nicest to drive at city speeds, has the most comfortable cabin, the best seats, and comes loaded with tonnes of equipment. Despite it being the second-most expensive here, we think it’s worth every rupee.